Himachal is being gifted with tremendous sovereign natural beauty that salubriously includes the include adventure sports spots and scenic magnificence out of which the Sach Pass is the most captivating location in the Pin Parvati Valley of Kullu district. Also pronounced as Sar Pass, where “Sar” means lake in local dialect. Thus, the Sar Pass Lake trek is a journey around the gushing rivers through the lush river valleys surrounded by snow-capped peaks, fruit-laden orchards, gurgling streams, dense forests and ancient temples with birdsong bringing the best opportunity of enchanting the trekkers to mesmerize the beauty of the Himalayas. The name Sar Pass Trek just justifies when the trekkers while moving through the hilly tracks across the path from Tila Lotni to Biskeri Ridge pass by a small lake dressed in snow (Sar). The whole region has been explored by different trekkers over the ages. The path through Grahan (7,700 ft) had been marked as the first camp after Kasol, followed by Padri (8,900 ft), Ratapani (10,700 ft), Nagaru (12,500 ft), Biskeri Thatch (11,000 ft) and Bhandak Thatch (8,000 ft). The Grahan Pass was the first chosen track and after several experiments made on different courses to adopt, this track has once again become the trekker’s first choice on the way to Sar Pass. 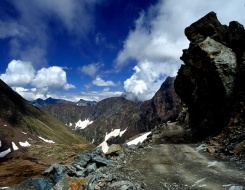 On fourth day of Manali - Chamba - Sach Pass Trek, we drive for around 7-8 hours to reach Raoli. Next destination of trek is Sach, where we reach after 6 hours trek and en route we visit temples with wood-carvings. The splendid temples and the antiquities in this region could not have been possible but for some of the enlightened and religious rulers of Chamba. This region was also lucky that it did not face the problem of a ruthless destruction by invaders or internal disruption. Overnight in Sach. We trek through green forest with spectacular views to reach Kilar. Overnight in Kilar. On the 8th day of Manali - Chamba - Sach Pas Trek, we climb for about 2.5 hours to reach Duna Sarai (2500 mts.) and then 3 hours further to Bagotu. Bagotu is sort of an "island" in the glacier. We cross two stone huts on way and pitch our tents or alternately we spend the night in the huts, spreading our sleeping bags on floor of the huts. Overnight in Bagotu. Trek continues with a 4-hour steep ascent to Sach Pass and then 2 hours down to camp. Overnight in camp. We continue early morning by going down to Alwas and then another 3 hours to reach Traila. Overnight in Traila. We drive from Traila to Chamba. Overnight in Chamba. After breakfast drive for Pathankot to catch Jhelum Express for New Delhi at 23:55 hrs. Over night journey. Arrive New Delhi railway station at 09:30 hrs. Upon arrival at Delhi transfer to Hotel. Evening transfer to airport to catch your onwards flight.